Used to love the Dhobie Wallahs coming around and taking the dhobie away in sh1t order and bringing it back like new.They did a great job for mere pennies too.In Singapore we used to have a wee woman who came around the billets and she was called "sew sew" or "so so"who would repair your ripped uniforms or darn your socks for you,again she did a great job for pennies.We also had some bloke who could bull your boots in no time.I used to come out of the ulu with my boots DMS in a mess and the boot boy would take them from me and clean them up.It was embarrassing when I was going back into the ulu with bulled boots on as the boot boy did all of my boots (I had four pairs) as the horrible Jungle boots did not fit me as I was a size twelve and they could never get my size.I eventually got a pair of Aussie boots from a couple of Aussies whom I had befriended and they were fantastic boots, lasted me for years too. Bit like the Gunner regime in Germany. I can recall being on Autumn/Winter exercises with other Regiments who were suitably kitted out in Parkas, Overboots, Scarfs, Wellies etc. Us? bog standard Combat Kit, Boots DMS and black webbing that had to be cleaned/polished - stopped us getting bored, I suppose! Jeez Brian ! you had it hard....... No black webbing for us, in the old days, we kept smart with Pickerings Artillery Green blanco. tickled up daily. Thin woolly- pully with V-neck, pyjama bottoms and BD trousers under denims in the snow. No BD blouses but sleeveless leather jerkins on top. I was lucky riding the Matchless ( I thought ), I had a Don R mac to keep out the rain instead of the groundsheet the rest had. But that caps comforter was useless as a cover at the neck, I used a brown check civvy scarf until G-Troop WOII threatened me with a charge for being improperly turned out. And strangely, when it got too nippy on night moves, his BSA M20 always managed to develop a fault so he could sling it in the back of a QL. That left me shepherding thirty odd vehicles instead of just BHQ Troop's packet.......... To be fair, though, if I'd allocated a different bike to the TSM in the first place, he wouldn't always get one that was dodgy. 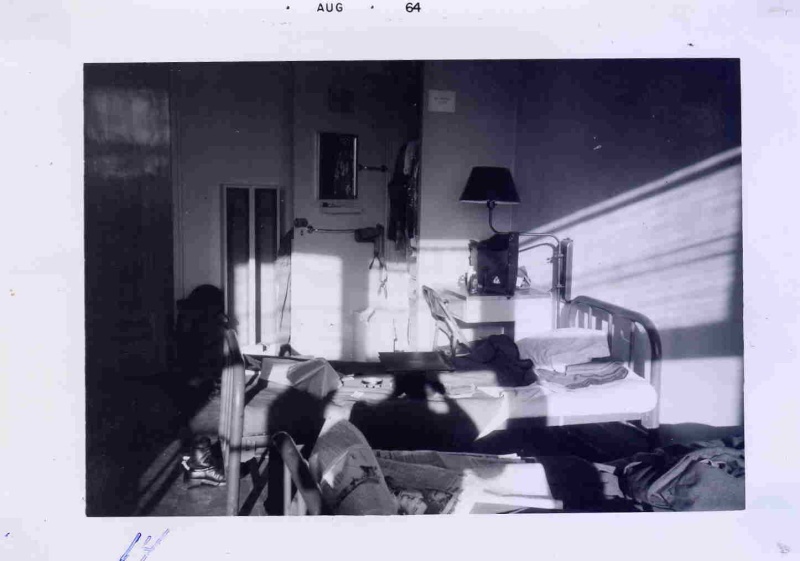 In 1966 I was in BMH Iserlohn having my Appendix removed, in the same was was a Canadian soldier from Verl who had been involved in a traffic accident. He had been wearing weights, which were fashioned from a thick metal at the front in a "U" shape, with a small chain at the back, the impact of the crash was such that he almost lost both feet. Okay in 66 I was just up the road in Deilinghofen. How come you didn't give me a call. Tsk, tsk. Incidentaly sounds like the fella who had the accident fashioned his own weights. Better off to buy a set from the MLS or CANEX as it became after. In the photo you'll see my boots with weights over them at the foot my bed and can just make out my putties rolled up and in the boots. Camp Shilo 1964. There you are, a fine example of a Signalman in his best bib and tucker with putties. Signalman Rogers (Rad Tech) All spiffed for G.O.C. 's parade in Camp Shilo. The WW 2 H-Huts in the back ground are long gone. Have always wondered wher he ended up. Last saw him in 64 prior to posting to Germany. You didn't leave your 'phone number when you came to visit! 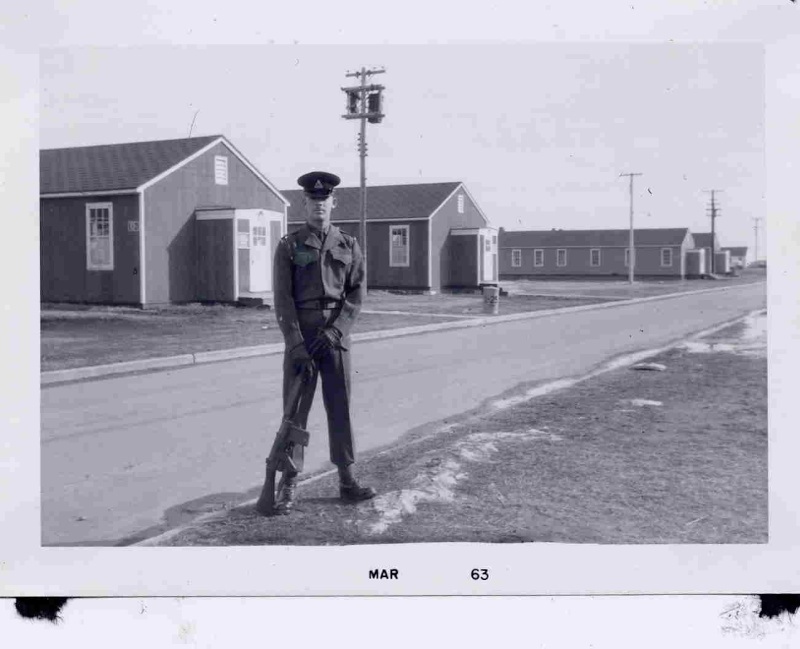 Hardrations, the piccy of the huts at Shilo brought back memories, we were accommodated in them in 67 after moving from Arizona to Shilo to complete user trials and cold weather trials on the Midge Drone. I would guess that you stayed in the Q Lines, near the Jump Tower. The Q Lines were evenutaly used by Germans from 74 on until they left. My Father-in-law, got a kick out of that. He lived in them in WW 2 training for Italy. Then to see his former enemy living in them, was something different. The huts you see in the picture were used as class rooms spaced around the Pde. Sqr. at the north end of Shilo. Hardrations, What sort of capbadge is your Sigmn Ro... wearing ? It's the old RC Sigs badge. @Nignoy Hello. Yes was there early 66 for 5 mths and agn later for one night till I rtnd to Singes under close arrest. We socialised down the village so missed the camp ructions, particularly when the Aussies had their kangaroo icon overpainted by the Engs/ bulldog on the new bar front. Then spent Dec to May at the Comcen preparing for my return to Civvy st. Apart from setting fire to my mosquito net on retiring after a heavy session downtown I had no other incidents in Long Nok Tha. We stayed in Bangkok overnight but on arrival in Ubon were met by three ton Bedford to the camp.